What a bad year for black flies! My gardens are on top of a windy hill and I’m still getting munched to bits. I don’t even feel them biting, I’m just all speckled with blood when I come in for breaks. The other day my son asked me if the raspberries were out already. He mistook my bloody face for the remnants of a raspberry feast! I guess he thinks I’m a messy eater?! 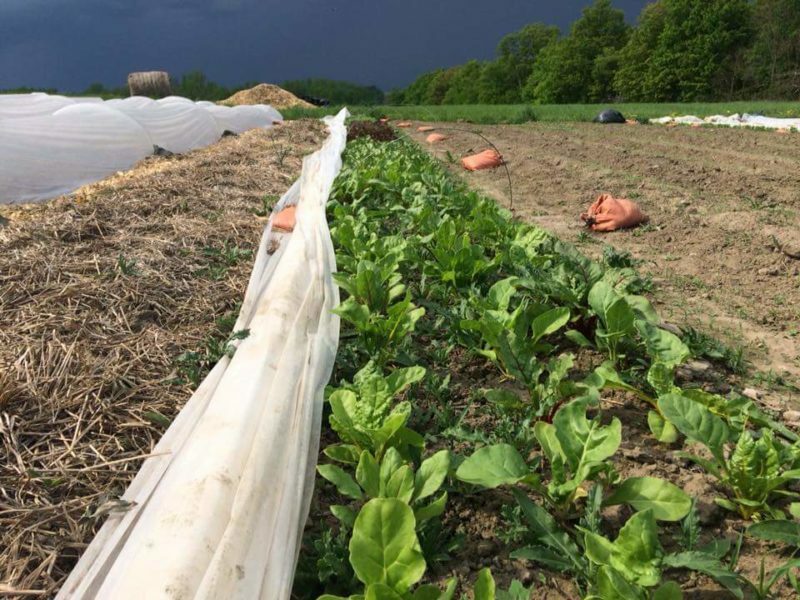 The bugs haven’t held Nadia Simard of Undercover Farm back this spring. She’s got lots of good things growing. Nadia says she prefers black flies to mosquitos any day! She stopped by the market last weekend with her family. 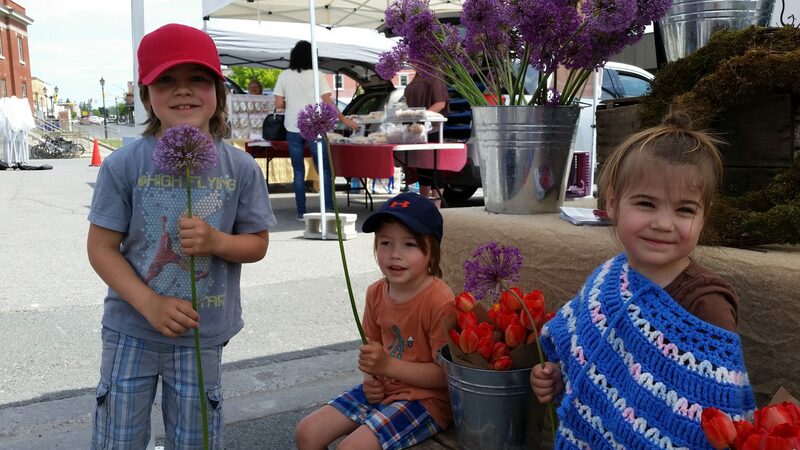 I couldn’t resist snapping a photo of her children with some globe allium flowers. Nadia will be back as a vendor this weekend. Her top-notch produce has been missed! 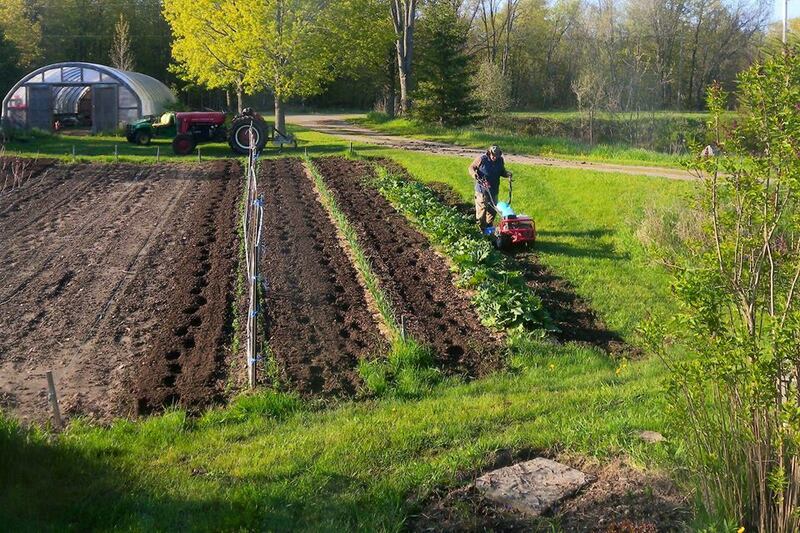 Lots of gardening on the go at Campbellford’s The Community Edibles Garden too! 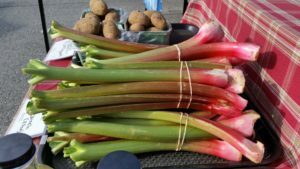 We’re excited to welcome the folks from The Community Edibles Garden to the market this Saturday at our community stall, to share the news of their exciting garden plans for the season. They held their annual Plant Day last Saturday and it was a success. Be sure to stop by, say hello, and learn about their wonderful garden. How are your gardens looking? The plants at Rainbow Terrace and Evegroen Gardens have been flying out of the market. 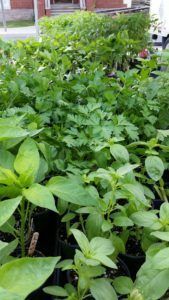 There are still lots of vegetable, herb, perennial, and annual plants to chose from. Amanda and Helen have lots of knowledge and experience gardening. They can help you make the right choices for your space. They are both at Wednesday and Saturday markets. Claude Cayer of Art de Claude is back this Saturday with his fantastic woodwork. I’m excited about his new Dibbler Garden Tool design. If you love working with beautiful tools you should add this one to your garden shed. It’s useful for transplanting seedlings, planting bulbs, or making furrows for seeds. The fact is that I never use my thumb to grow vegetables. I squash potato bugs with it and occasionally mistake it for a nail. So my thumb is either smeared with bug-juice or painfully blue from a hit by the hammer, but never green. On the other hand, I do suffer from this craziness over a patch of fertile soil. It calls on me in the most enticing manner to put a seed, a plant, a bush, a tree into it and let it grow. In high school, during my university years studying law, economics and history, as archivist, as document restorer, as museum curator and as insurance agent I always dreamt of being a farmer. I finally made it when I was close to retirement age. The weird thing about this dream is that I did not grow up on a farm but in a big city. I have little to no training in agriculture. In school I flunked biology and chemistry and have therefore no idea what the letters N, P, and K on a fertilizer bag stand for. I stay away from discussions with experts about alkaline and acidic soils and about trace elements, because my ignorance would show the very moment I open my mouth. I believe that my pre-occupation with soil (EARTH) is that I regard it as a living being who I wish to be friends with. I feel therefore no need to change its personality (i.e. fooling around with pH values or experimenting with trace elements) or force it to do something it does not want to or can do. From a business point of view this is certainly a bad attitude if I wanted to consider returns on investment, the cost of labour, expenses for supplies and maintenance. However, the permanent damage caused by agri-business, e.g. monoculture, excessive use of herbicides and pesticides, pollution through fertilizers, soil wash-out from irrigation must be a permanent warning sign for all who want to make a living off the land that soil is a non-renewable source. If you take good care of your soil it will last forever, but once it’s gone it is gone. 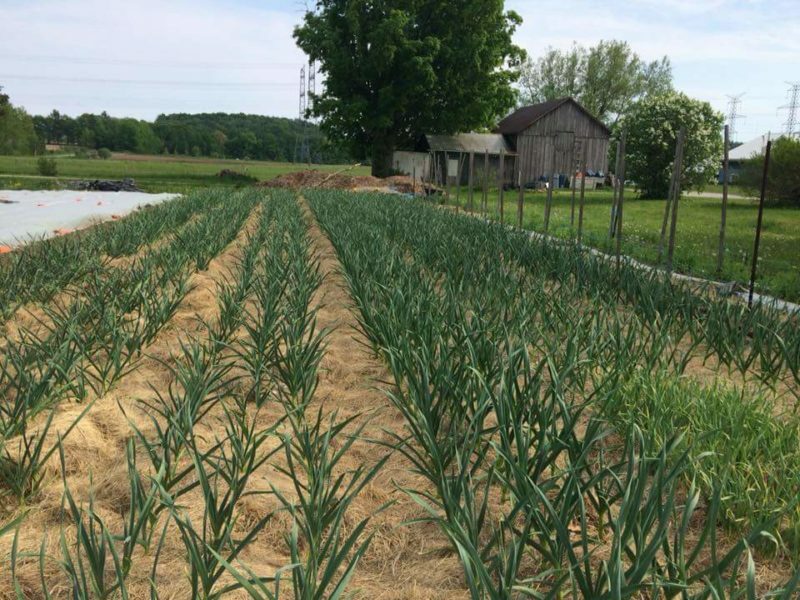 Agriculture has already been pushed out of some of the most fertile areas in Ontario to make room for residential development. I still remember the rich farms in Waterloo, Markham, Stouffville, Richmond Hill, and Oshawa. Now they are what I call “house farms” and grow – if anything – putting-green lawns. Try to live off that stuff! I am sure that most farmers agree with my sentiments, but they have to make certain compromises just to stay in business. I can afford the luxury to have a more intimate relationship with my small patch of land. After 25 years on our 4.5 acre property in Rawdon Twp. I have worked on just about every square inch of workable land. It has not always been easy. There is no romance in dealing with rocks, all kinds of noxious weeds, floods, droughts, bugs, and the inevitable crop failures. On the other hand, it is such a glorious feeling when the garlic breaks through the winter mulch, when you taste the first strawberry, cut your own asparagus, and so on. 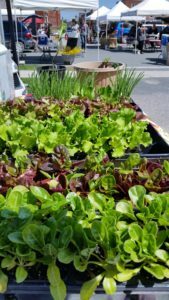 There are so many firsts during the gardening season that the excitement never ends. And all I really have to do for that pleasure is do is tend the land in the most unscientific manner. I just follow my instincts and let the land teach me. The rewards are huge. 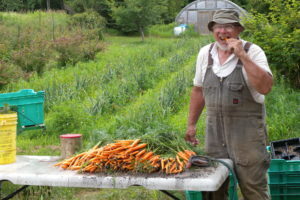 Not only do we grow the best-tasting vegetables for our own consumption, but I also get my physical exercise, make friends at the farmers’ market, and even earn a bit of money. I can take time for landscaping and other creative projects. Somebody called our land a “piece of Paradise”, and I believe that he is right. I could not think of a better life, but a green thumb I have not. 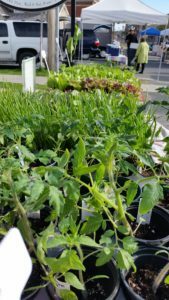 You’ll have noticed lots of plants for sale at the market this past week. Now that we’re approaching our last frost date, there’ll be even more: vegetable plants, annuals, and perennials. 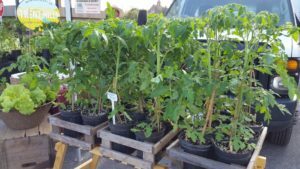 Why buy your plants from us and not at a big box store nursery? What could the difference be? The first and foremost difference is quality. 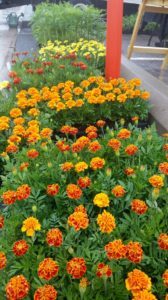 Big box store nurseries often pump their plants full of chemical fertilizers to get them to grow fast and bloom early. Plants with pretty blooms sell quickly. But once you get those plants home they often suffer because they’ve been so intensely and artificially nurtured. Ideally you want plants with a solid foundation, good root structure, and lots of life and blooming *ahead* of them. Resilient plants, started in greenhouses but slowly hardened off to the outside world, will thrive in your garden with little pampering – unlike the hot house beauties that will soon fade. Plant stress is also a big difference between our plants and box store plants. Our plants have not had far to travel, and they are in constant care of experienced gardeners who have a vested interest in their survival. Big box store plants can be stressed from travelling long distances, and then often receive inadequate care by amateur gardeners in temporary pop-up nurseries. We’ve all seen trays of wilting sun stressed annuals parked for weeks on rolling racks. What about perennials? When you buy a plant at our market you know that it has thrived in a climate similar to your garden. 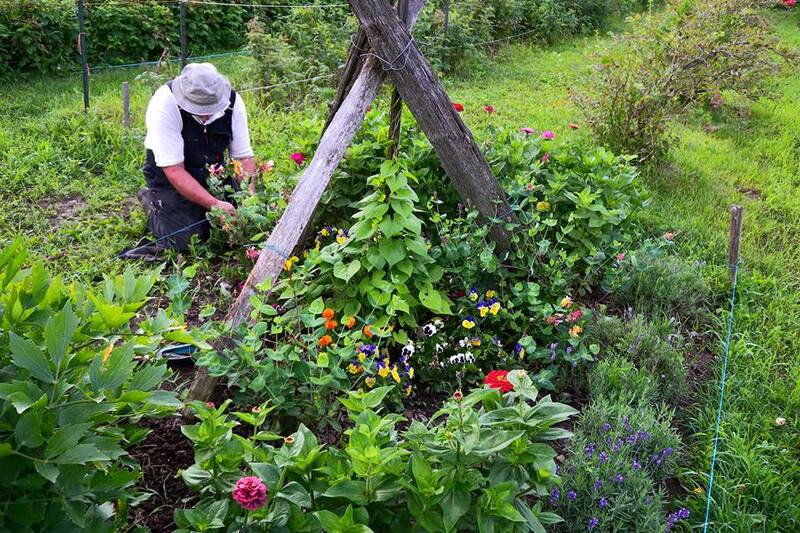 Buying perennials locally is always the best choice for success. 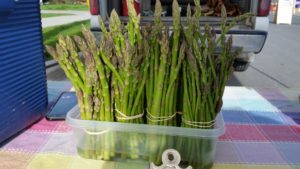 Other than plants, we’re starting to see asparagus, rhubarb, and fiddleheads at market. Come early – they go fast! What’s special on Saturday this week? Dale McIlmoyl of Campellford Bicycle Repair is back doing bicycle repair again on Saturday. Bring your bike to the market and he’ll get it all tuned up for you to ride! Blue Dot Northumberland will be set up in our Community Stall this week. They are a non-profit group that is working towards ensuring that all Canadians have the legal right to fresh air, clean water, and safe food. They’d love to talk to you about their project. White Pine Wood Creations are back this year with their stunning photos mounted on pine. I love the photos with local landmarks. They do custom work too! Campbellford teen Cassiday Tizzard, amazed us all with her feel good business TizzArt last summer. She’s back this year again putting her artistic talent to good. 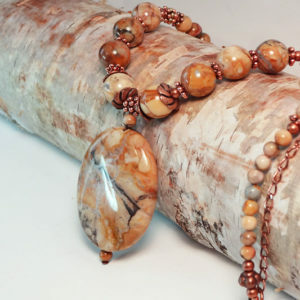 She donates 15% of her profits to charities around Trent Hills and Ontario. 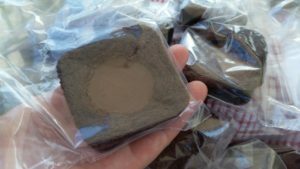 Northern Life Soap is making a debut at market on Saturday. They’ve got lots of interesting cold processed soap and bath bombs to choose from. I’m probably not the only one this time of year who could make use of their popular “Gardener’s Soap”! Shamrock House is also new to us this year. Baked dog biscuits, soap, jewellery, and hand weaving are some of the goodies we have to look forward to from them. And the cherry on the cake? 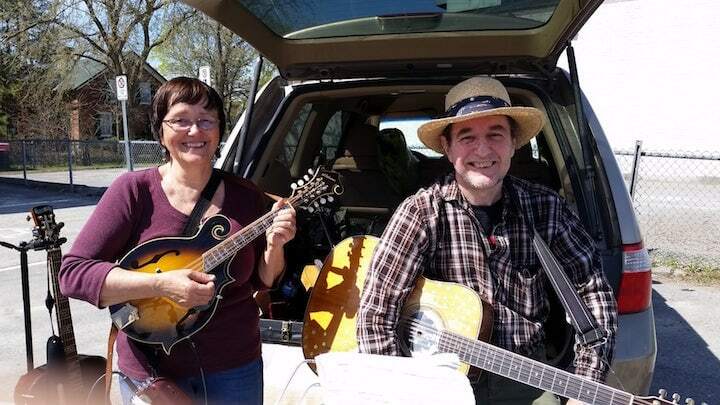 Ean McMillan and Eleanor Belanger will bring the market to life with their lively tunes. As always, we’re so happy to have them perform for us! 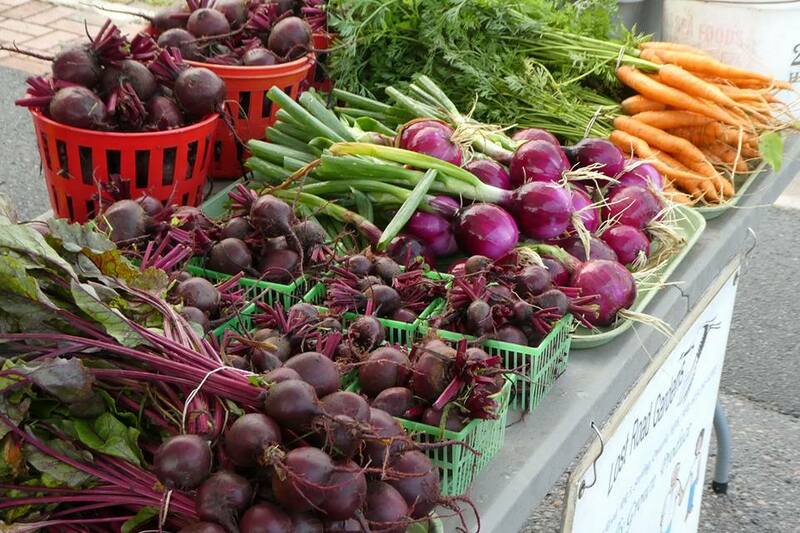 What a fantastic start we had to the market season last week! Thanks to everyone who stopped by. It’s nice to be getting back into Wednesday and Saturday morning summer routines again. Our full time vendors were back with all of our favourite products: Roasted Garlic Hummus from Rainbow Terrace, Margit’s Jams from Lost Road Gardens, scones from The Philosopher’s Scone, Mixed Sprouts from Glenlea Farm, Evegroen Gardens’ happy spring pansies, and Howson’s Pure Maple Syrup and Honey, of course! We also had lots of new products to enjoy. 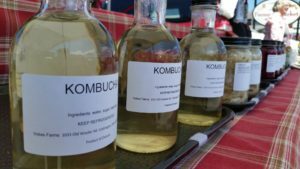 Andrew of Vokes Farms has been busy fermenting vegetables and had a table full of new foods. His Kombucha is so refreshing! A2 Baking Creations has also expanded their offerings. Their Peanut Butter Cup Brownies (yes that’s right, a peanut butter cup baked right into a brownie!) needless to say – were a big hit!! We’re happy to have Melly Rolls join us. Melissa’s market debut on Saturday was a huge success! Lots of people were smitten with her delicious sushi rolls. We’re happy that she’ll be here on Wednesdays too. Her food is a great early lunch option for people working downtown. May-June of My White Rose is back from her winter away in warmer climes. You’ll remember May-June’s 100% Organic, Raw and Unprocessed Shea Butter, among other homemade skin care products. She’ll help you find what you need to nourish your skin. Anita’s Creations made a splash last week with beautiful decorated cookies. 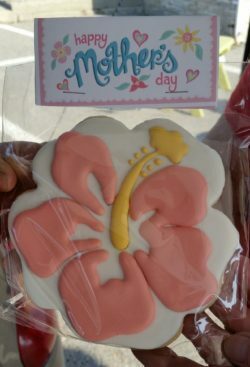 Anita’s got lots of special cookies for Mother’s Day – but she’s only with us on Wednesdays so be sure to stop by then. New vendor Healey Falls Bison Farms will be starting with us. I love all the local meat options we’ve got at the market this year. Between beef from Russett Farms, and pork and lamb from Braelea Acres – we’ve got you covered! Two fantastic artisans are with us this Saturday, both with lots of items suitable for Mother’s Day gifts. 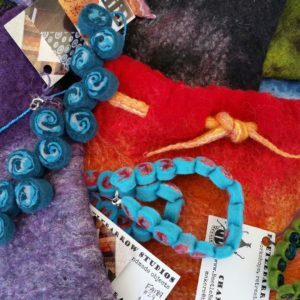 Studio Grace has beautiful handmade jewellery to chose from and Chandra Rice’s ceramics, handmade books, jewellery, and fibre arts are to die for!! Come mid morning and you’ll catch the Stirling Citizen’s Band in action! We’re so lucky to have them come share their talent with us.